I’m re-reading The Tao of Pooh by Benjamin Hoff for the umpteenth time. It’s a great bit of philosophy using Winnie the Pooh-isms and scenes from the great A. A. Milne children’s books to explain Taoism – The Way. I don’t advocate the Tao as a way of life for everyone all the time but we can all use a little of the wisdom within its teachings. Why mention this here? It’s what being in the forest is for me – The Way. Pooh just is. That’s what I love about being in the forest and on the water – I just am. The animals of the forest don’t think too hard – they just are. Somehow being in the woods allows that state of mind and way of being for me and obviously for lots of other people too. It would be nice to Just Be all the time but somehow life doesn’t often let us Just Be. We become Busy Backsons like Rabbit or bounce off of everything like Tigger or become absorbed with facts like Owl or focused on what isn’t like Eeyore or too timid to try like Piglet. 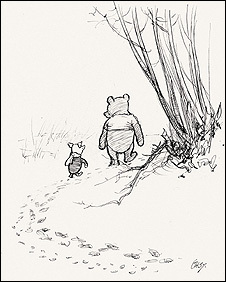 Pooh and Christopher Robin aren’t concerned with Where they are going in the forest, just that they are going Together. Pooh doesn’t try to be Something he is not or change the world around him. Doing Nothing on a lovely day is about as good as it gets. Except of course when you can have a Little Smackerel of Something while doing Nothing. His needs are Few and Simple. He doesn’t try to Explain things. He just Enjoys them. He Really Sees things because he isn’t looking for them. He’s That Sort of Bear. Maybe being in the Boundary Waters just gives people permission to be That Sort of Person. Traveling though canoe country is a little like a lesson in The Pooh Way – or the P’u Way if you want to get deeper. Getting to a particular place is less important than enjoying the trip as it happens. Catching a fish is less important than enjoying the act of fishing and the Anticipation of Something Good. Dealing with (insert: weather, bugs, steep portages, damp firewood, unexpected cold) is just part of the journey and adds to the adventure – if you let it be a positive part of the story. We can all use a place to get away. A place to live life simply and just be. The Boundary Waters is a little like Pooh Corner and the Hundred Acre Wood. Where you can Just Be.